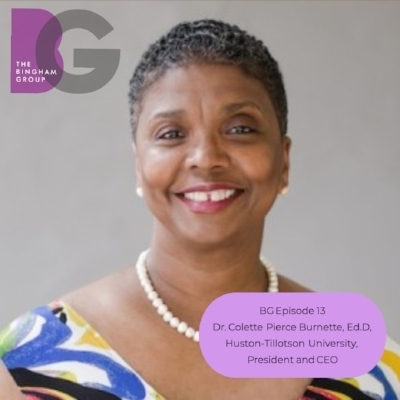 Today's podcast was originally recorded on August 27, 2018 and features a discussion Dr. Colette Pierce Burnette, Ed.D., President and Chief Executive Officer of Huston-Tillotson University (HT), a private historically black university located in Austin’s East Side. The East Side is one of the most active areas for commercial and residential development in Austin. Our conversation covers Dr. Burnette’s vision for how HT (which owns several blocks) will navigate the wave, as well as connections to the Austin community overall. Dr. Colette Pierce Burnette, a native of Cleveland, Ohio, joined Huston-Tillotson University as President and Chief Executive Officer July 1, 2015. Dr. Pierce Burnette is an experienced leader in higher education with a deep commitment to student success. Her experience includes serving as interim President at Pierce College in Puyallup, Washington; the Vice President for Administration and Chief Financial Officer at Central State University in Wilberforce, Ohio; Vice President for Information Technology and Services and Chief Information Officer at Central State University; Dean of Information Technology at Pierce College in Lakewood, Washington; and Manager of Consulting and Project Management Services at the Washington State Department of Transportation in Olympia, Washington.